The latest figures from the Canada Mortgage and Housing Corporation support the frequently-heard forecast that the market is heading for a soft landing. The third quarter Housing Market Outlook says that economic and demographic fundamentals will continue to support housing activity into 2015. The report predicts a reduction in housing starts with builders reducing inventory instead. On prices, CMHC expects 4.5 per cent growth in the average MLS price for 2014 with a more modest 1.8 per cent next year, while MLS sales volume is expected to continue growth. Read the full story. The Teranet-National Bank’s house price index reveals a 1.1 per cent rise in prices in July compared to the previous month. The index tracks 11 cities and nearly all saw increases with Victoria, Ottawa, Toronto and Quebec City recording the biggest rises. 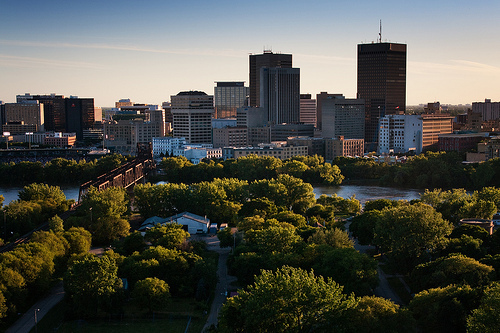 Winnipeg was the only city to see decline, for the third month in a row. The city tops the index though, having seen an increase of 94.21 per cent since 2005. Calgary, Toronto, Hamilton and Vancouver have seen the biggest year-over-year increases; Edmonton, Victoria and Montreal had modest rises; while Winnipeg, Ottawa, Quebec City and Halifax have all seen prices drop over the year. Read the full story. Wooden skyscrapers – the future? When I think of a wooden skyscraper, a giant Jenga game is the image in my head, but there are an increasing number of timber tower evangelists. In BC the number of storeys in a wooden construction was raised from four to six in 2009 and there are many completed examples of how that works. Modern methods mean that wooden framed buildings are safer than before and Vancouver architect believes that they will get taller and taller. He has previously suggested that wooden towers could be up to 30 storeys high; he now thinks that 45 or more may be possible. The likelihood is that wood would be combined with concrete and steel to get the best of both worlds. For now his firm has recently completed a 7 storey building at the University of Northern BC and is planning a 16 storey wooden tower there too. Read the full story. If you are aged between 45 and 64 you are likely to be part of a ‘sandwich generation’. In other words, you’re in the middle of two other generations for which you have some responsibility, your kids and your parents. BMO Nesbitt Burns conducted a survey of this age group and found that 55 per cent are looking after relatives with a third caring for a senior. The survey found that many of the respondents are concerned about their role as carer having a negative effect on their finances. The biggest worries include saving for retirement, children’s college education and paying down the mortgage. The majority of this demographic are behind in their savings plan. Read the full story.